As the old saying goes, a blunt blade is more dangerous than a sharp one. Keeping your lawn mower blade honed improves its performance, giving a cleaner cut to your lawn. A sharp blade also puts less stress on the mower and prevents clogging during operation. It may not seem like an important task, but a good blade can vastly improve the condition of your lawn. You should consider sharpening your blade at least twice every mowing season. Although it is a relatively easy job, special safety precautions must be taken to prevent injury. Most importantly, the lawn mower should be disabled to ensure there is no chance of it starting up while you are working on it. The best way to guarantee this is to disconnect the spark plug, which can be done by removing the spark plug wire from the plug. It’s worth noting though, that if a blade is beyond repair and even sharpening it won’t help. If this is the case, then replacement blades can be bought cheaply. If the whole unit is in pretty bad condition, you may want to consider buying a new model. Be sure to check out our handy lawn mower buying guide for guidance. 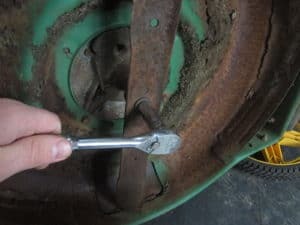 1) Before you remove the blade from the lawn mower, it can help to mark the bottom of the blade to avoid reinstalling it the wrong way around when finished. 2) Loosen the nut with a ratchet and carefully detach the blade. 3) Clean the blade with some soapy water and dry. If there are traces of rust on the blade, clean gently with steel wool or scotch-brite. 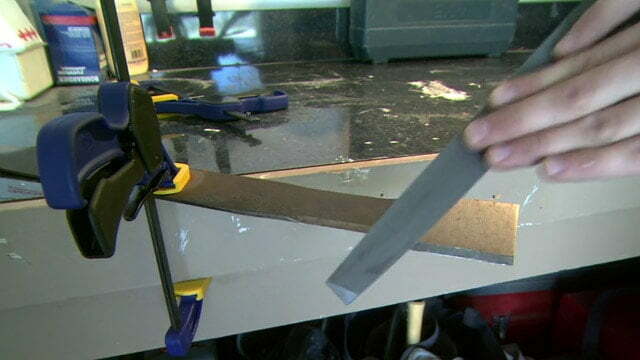 4) Secure the blade in a vice or clamp and begin running a file along the edge of the blade. Alternatively, you can use a drill with a grinding attachment. Follow the angle of the bevel of the blade while filing. 5) If the blade edge has suffered extensive damage, it may be easier to sharpen with a grinder. Remove any gouges from the blade by running it perpendicular to the grinder, then proceed to sharpen the blade by holding it at an angle to the grinding wheel. This process generates heat, and you will need to immerse the blade in water frequently during sharpening to keep it cool. 6) Once the blade has been sharpened, check its equilibrium by balancing it from the centre point. If it is not balanced, file some material from the heavier side (not from the honed edge) until it is offset. 7) Replace the blade, tighten firmly and then reattach the spark plug wire. Routinely examining your blade for bluntness and filing when appropriate will make it easier to sharpen in the long run. If you have any problems or are unsure, any mechanic or tool hire shop will be happy to help.